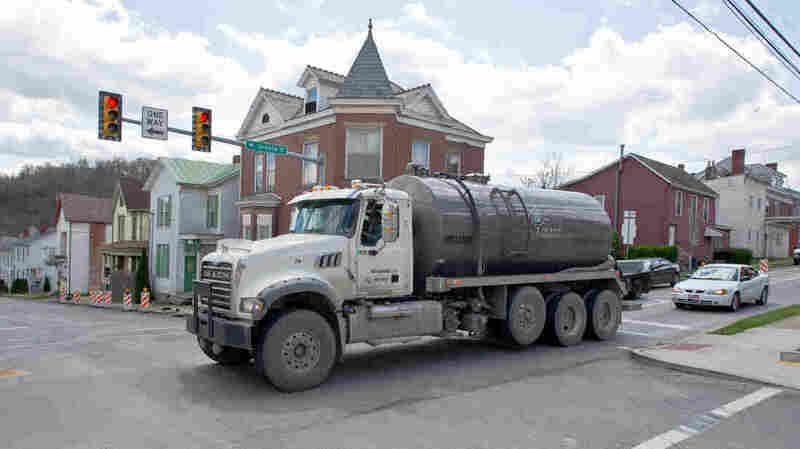 Rising Shale Water Complicates Fracking Debate Naturally polluted water from the Marcellus Shale can rise up through the natural-gas-rich rock formation to the surface. That means that water used in fracking potentially could, too. The water may be making its way up through natural fractures in the earth or old oil and gas wells. The nation's boom in natural gas production has come with a cost: The technique used to get much of the gas out of the ground, called hydraulic fracturing, or fracking, has contaminated drinking water. But how often and where this contamination is taking place is a matter of much debate and litigation. Now, a new study has found natural pathways of contamination — but that doesn't mean the drilling industry is off the hook. When gas drillers frack, they pump millions of gallons of water, mixed with sand and chemicals, down into a layer of rock called the Marcellus Shale of Pennsylvania. That helps free up natural gas that then comes to the surface. But some Pennsylvanians say that polluted water may be seeping back up. They report a salty brine, sometimes laden with dangerous metals, in their water wells. Industry officials say no: The Marcellus layer is over a mile deep — too deep for water to seep up through all that rock and get into water wells. Scientists from Duke University have published a paper that says that, in fact, water can rise up from the Marcellus layer. "What we show in this paper is that there are certain places that it does look like there are connections from the surface to deep underground," says Robert Jackson, an ecologist and chemical engineer. His team studied over 400 groundwater samples. Some were slightly salty, or briny, and some were very briny. They looked for the chemical fingerprint of brine from the deep Marcellus layer. And they found it in the saltiest samples. "The water found in those locations looks very salty, like what you see deep underground and contains gases, and just looks like the deeper brine," he says. There's a catch, though: The briniest water wasn't near operating gas wells. In some cases, the samples were taken before fracking came to the state. Writing in the journal Proceedings of the National Academy of Sciences, Jackson says that suggests there are some natural conduits that allow deep, briny water to rise to the surface — from the same shale layer that gas companies are drilling into. Jackson says he's trying to distinguish what's natural seepage and what may be from fracking. He's also studying how it gets up, too — through natural fractures in the earth, perhaps, or old oil and gas wells that predate the fracking boom. "They are a possible conduit for movement of salts or fracking chemicals or even gases up to the surface," Jackson says. "But we just don't know how likely that is." The discovery complicates the fracking debate. It suggests that briny water with methane or metals like barium or strontium isn't necessarily from drilling. But it also means that if natural water is coming up from over a mile underground, the drillers' frack water could come up, too. Jackson says the findings need to be confirmed with more research. David Yoxtheimer, a geologist at Penn State, says in the meantime, it will cause arguments about fracking. "I think it could certainly fuel that debate: Do we understand the geology well enough to know that, you know, we can do this safely without impacting groundwater?" Yoxtheimer says the Marcellus layer is pretty dry and spongelike. It can absorb lots of water from fracking without returning it to the surface until it's soaked through — an unlikely scenario, he says. And it could take centuries for any kind of water to rise a mile through rock. Brian Stewart, a geochemist at the University of Pittsburgh, says the Duke research is part of an effort to diagnose what Pennsylvania's water looked like before fracking and after, in a state whose water has experienced over a century of industrial pollution. "It's a mess when you look at it. When you look at any individual source of pollution it seems almost hopeless, but it's really not," Stewart says. "You need sort of a mixed tool bag, but I think we're starting to get there." And the research does identify areas with clean groundwater, with little or no natural salt or pollutants, so that if something nasty shows up in that water, it's most likely not natural.